The extended cold weather this year really has made fishing tougher on almost all North Texas lakes including Cedar Creek. Water temps were commonly reported in the 56 to 58 degree range and the weekend was without much sunshine to warm the shallow spawning areas. Catch rates and fish size (Hourly winners and Final Standings) were also lower than historical averages. 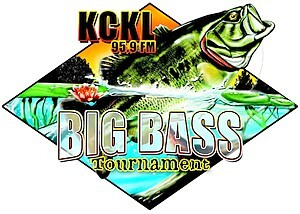 During the previous 30 years of KCKL Tournaments, the average size of the Tournament winning bass was 9.54 lbs. 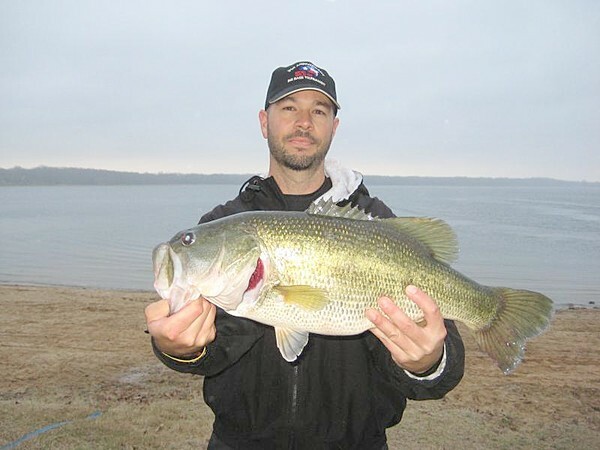 On the low side, the record for the smallest Tournament winning bass was 6.64 lbs. in 1986 and the largest was 13.30 lbs. in 1996. 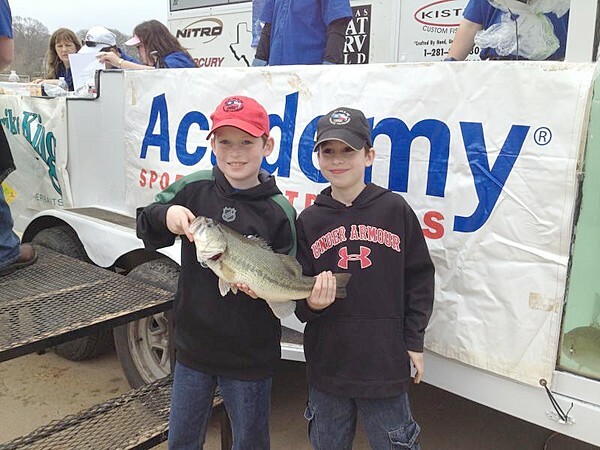 Over 700 anglers participated in this year's Tournament. 25 Places were paid in the overall Final Standings plus 5 Places in the Ladies Division and 10 Places in the Youth Division. 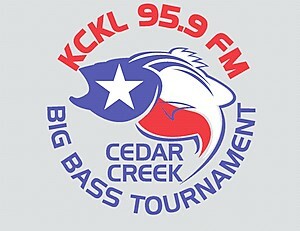 Additionally, 80 Hourly cash prizes were awarded to the 5 biggest bass each hour. After final weigh-ins were concluded each day, over $16,000 in Door Prizes were given to the Adult and Youth anglers in attendance. Brandon Vaughan of Maypearl caught the Tournament winning bass of 7.10 lbs. on Sunday and bumped his friend and team tournament fishing partner, first day leader Jake Brewster to 3rd Place. Brandon reported catching his fish on a spinnerbait and Jake got his on a creature bait flipped into shallow water. They reported looking for, but not being able to see bedding fish due to the stained water. Brandon had some non-fishing bad luck on Saturday but his good karma appeared Sunday and we were glad to see Brandon prevail as this year's winner. Brandon Vaughan of Maypearl with his 7.10 lb. bass which won him $5,200 plus the 2014 KCKL Champions Tackle Bag and Hat. As you can see in the background, the day was cool and cloudy. For quite a few years several anglers have fished with us playing the Hourly weigh in strategy game for quite a few checks. Scott Dean of Terrell picked up the same strategy and weighed in 8 Hourly fish to pick up 7 checks for a total of over $800. The Tournament also offers $100 for each 3.00 and 5.00 bass weighed in and many tried, but for the first time in 6 or 7 years, no even weight fish were brought in. A funny story we heard at Registration - a couple of tournament anglers went out Friday afternoon to test run their boat that had not seen the water for a while. Things were going smoothly as they ran across the lake when all of a sudden the family cat came out of hiding from within the boat. They stopped in the middle of the lake and attempted to corral the cat, but the terrified feline would have none of that and decided to dive in and swim. Out came the dip net and in came a mad, waterlogged cat with a nasty attitude. Guess you could say they tested a new form of "catfishing". Bet untangling a mad cat from a landing net was not much fun either, so hope the rest of the weekend went better for them. Junior angler Charlie Woertendyke caught his personal best big bass of 4.02 lbs while fishing with his brother and dad. They have been coming to the Tournament for several years and dad doesn't fish, he just guides these guys. Want to thank Stan Browning of Dobyn's Rods for his participation and help in awarding the many Dobyns Rods Door Prizes and the additional prize to Brandon, any Dobyns rod of his choice. Also, thanks to Fun-N-Sun Marine for having Tim Brockway and David Gregg join us with the decked out Skeeter display boats.